I spotted a real bump on a log when I was coming back from feeding the chickens. 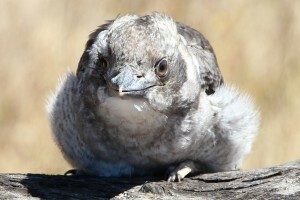 I realised it was a young Kookaburra. It didn’t take its eyes off me and swivelled through 180 degrees on the log to watch me go back to the house. I grabbed my camera and got quite close, but I didn’t want to frighten it. I was worried about it sitting out in the sun, so I went to get some water for it, but it flew off.